Yesterday was the day. Our very first snow day of this year. We got about two inches. It was quite exciting. Around here, such simple things as snow flurries are the cause of the empty bread aisle at the store and much rejoicing in general. Anyway, like I said, the snow has been very exciting. All the schools closed and Hubby stayed home from work. Also, the garbage truck decided to stay home instead of emptying our overflowing garbage can. But he redeemed himself today so all is forgiven. 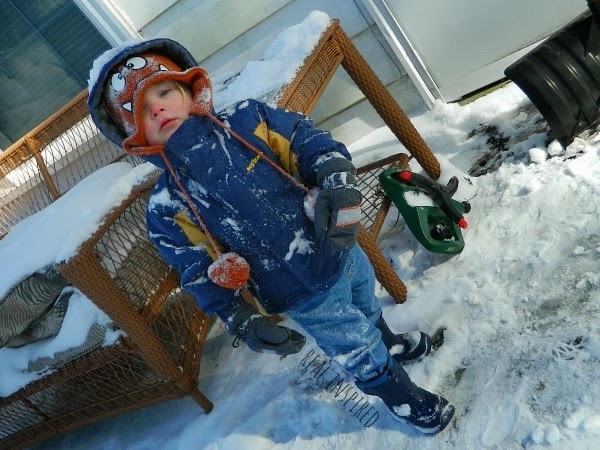 Only for him to decide that he hated his mittens, that it was cold, wet, and that he wanted to go back in. All within 10 minutes. He didn't last much longer when his daddy took him out again after his nap that afternoon. I don't blame him though. I was ready to go back in as soon as I walked out the door. My favorite childhood memory of snow is hot chocolate. We'd go out, get soaking wet and frozen, come in convinced we had frostbite, and then down a big mug of hot chocolate. Best thing. 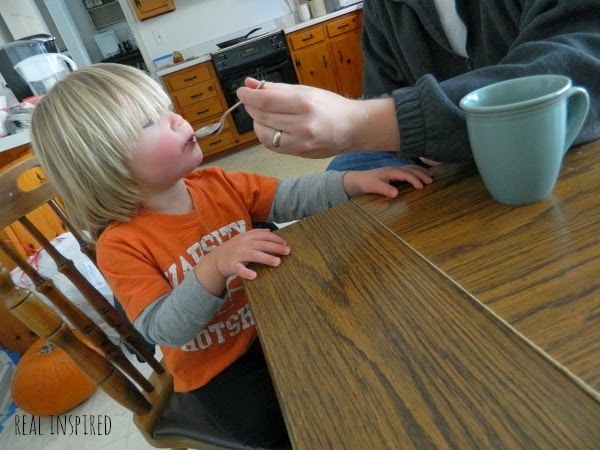 So I decided to introduce Little Man to hot chocolate. I love making these memories together! It sounds like a ton of people have snow right now. Are you one of them? 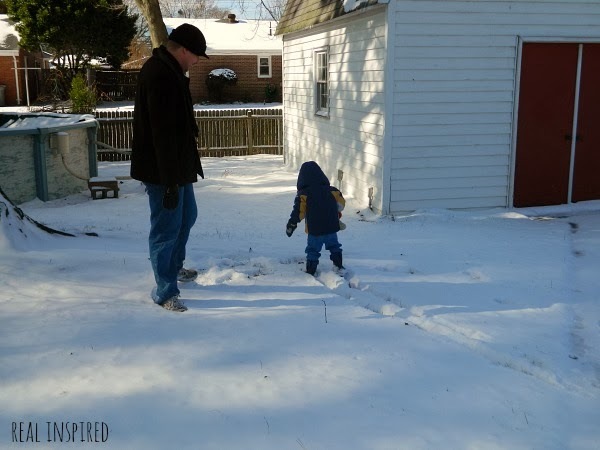 What are your favorite childhood memories of snow? Hi, I saw you on the Facebook group Bloggers on Blogger, so I thought I stop by and check out your blog. Very nice!! 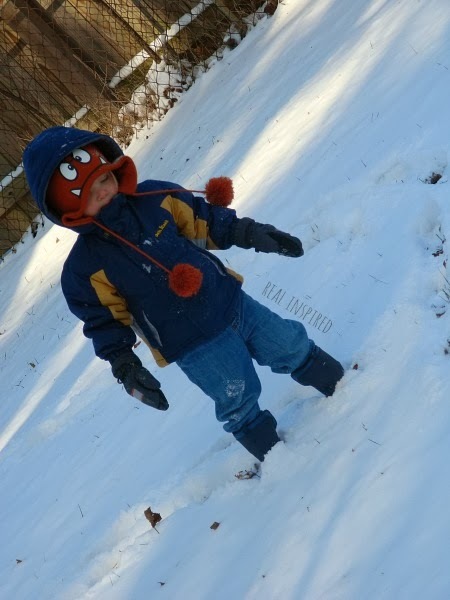 I love this post about the snow, I live in Minnesota where 2 inches of snow is nothing, but it all depends on where you live. Thanks for stopping by! This year, there was one day they closed the schools just because of the wind chill. No snow, just really cold! We have a few friends around here who are either from Wisconsin, Michigan, or Minnesota. They always get quite the kick out us Southerners freaking out over 20 degree weather!